Very thoughtful and well reasoned argument from Mark Suster (@msuster) on frothy valuations in the private venture markets, driven by the entrance of non traditional investors such as mutual funds and corporates at the late stages and crowdfunding at the early stages, and why this cannot last. Hard to argue with many of his points. The markets will come off, the question is how hard, how fast and when? Good time for sellers now. 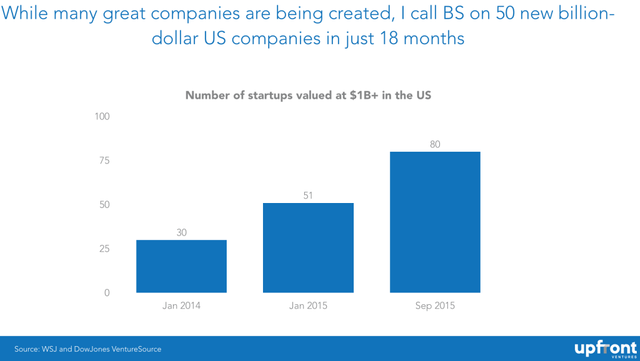 In the last 18 months in the US alone we’ve gone from 30 privately held technology companies worth more than $1bn (already considered high by some) to more than 80 companies just 18 months later. Either we’ve discovered magical beans and elixir or perhaps we’ve gotten ahead of ourselves on valuation.